Communications technology has accustomed us to rapid developments that seem to tend to accelerate further. The web first, telephony after, plus all the declinations and variations on the theme: streaming, chatting, blogging … and this is only talking about the attitudes and customs most common to our society. Today the theme of communication is the central protagonist in sociology, politics and scientific research. It was precisely the latter to investigate the profound skills of conscious and unconscious communication in living beings of any species, coming to describe hyper-communication: a link to a source of information, without the limitations of space-time. In nature this phenomenon has been successfully manifested for millions of years and the organized flow of insect life clearly proves this. Although many scientists support the possibility of developing this capacity in humans, we now have only an unaware experience that we usually approach as intuition or inspiration. The artist and engineer Sean Montgomery asserts that art can stimulate science in going further and in collaboration with the duo LoVid, presented at the RIXC Art Science Festival, the performance HIVE MIND: on stage the artist sits in front of an interlocutor with whom he has a non-verbal discussion. The “brain rhythms” of each actor generate violent impulses of light and sound that envelop the audience, synchronizing the cerebral oscillations of the spectators who are thus transported to altered states of consciousness. 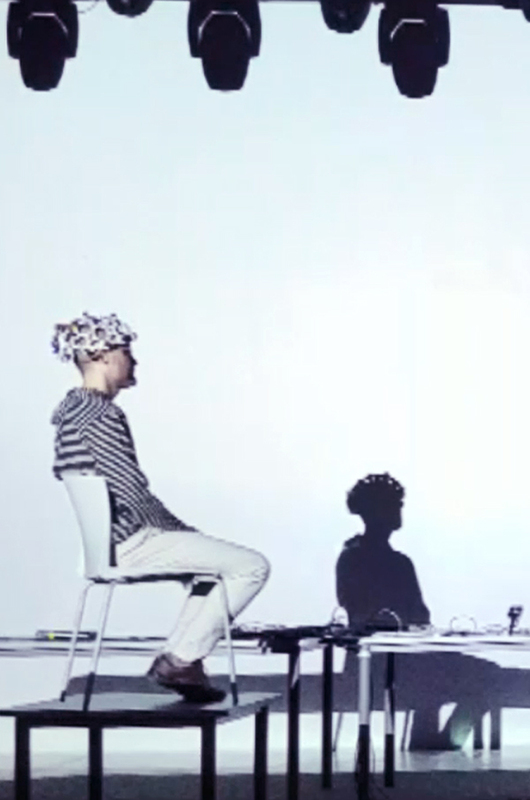 The actors and the audience live a series of induced brain states and altered perceptions, undertaking together a first journey with broad implications for the future of human cognition and communication.